After a recent update, our office has been getting this error message "Error loading Vision Library" when loading Vectorworks 2018. Clicking OK solves the issue but don't understand why this needs to show up every time. We do not have a Vision Library or work with the Vision software to begin with. Is there a way to disable the Vision Library? I saw this issue during development, but it is currently marked as having been fixed in 2018 SP0. What is the full path name to your Vectorworks installation folder? The original report was that any unicode characters in the path would cause the error. I too get this same error on my laptop install. Desktop works fine. in a direct message, I'll file a bug and start adding info to it. Thank you! I had it happen on VWA2018 SP1 until I uninstalled the application, discarded old preferences and reinstalled. Still plenty of other bugs in VWA2018 for me – undos, and OIP failing to show info on selected items – but this 'Error loading Vision Library' dialogue has now been fixed. 2) In your Vectorworks user folder: HD/Users/YOURUSERNAME/Library/Application Support/Vectorworks/2018/Plug-ins throw away the entire RuntimeCache folder. We're trying to make it so that more delicate surgery can be performed to fix issues. Previously there was one big hammer (The Preference Reset) to fix even smaller problems but you had to decide whether to live with the problem or rebuild all your settings and workspaces from scratch. This did not work for me either. I lied, it fixed the problem for one start it seemed, but now it's back and won't go away. Error Loading Vision Plugin Library! After reseting my default settings I'm now getting the above error message, was this ever resolved? A colleague is getting this as well. Not sure of his system specs, but I know he called tech support without good results. Has anybody found a solution to this yet? This is still an issue! Was there ever a solution or will it be fixed in the SP3 once released? Yes, I'm still having it when I start up after installing SP3. I suspect the only fix is a full preference reset or a fresh install. I've tried both a full preference reset and a fresh install and neither fixed the issue. 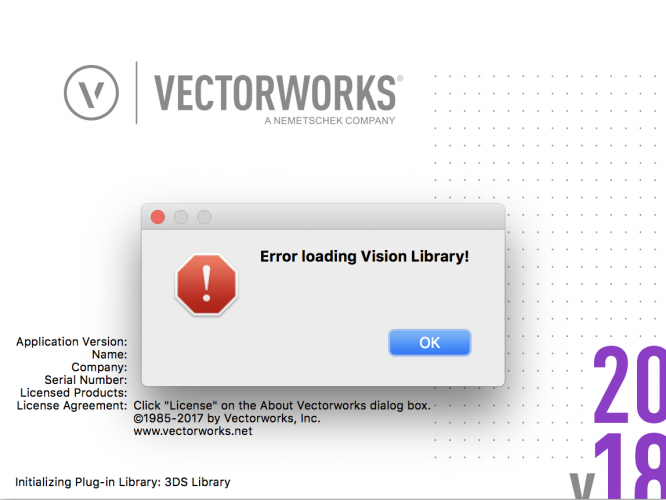 When you contact tech support about the issue please provide them the InstallerLog from inside the Vectorworks application folder along with your system configuration. We have not been able to reproduce the issue on our machines an we need to see if something is going wrong with the installation process on specific machines. I'm having the same problem. There's nothing about vision in my plugins folder. Been searching for the plugin to download, but can't find it anywhere. 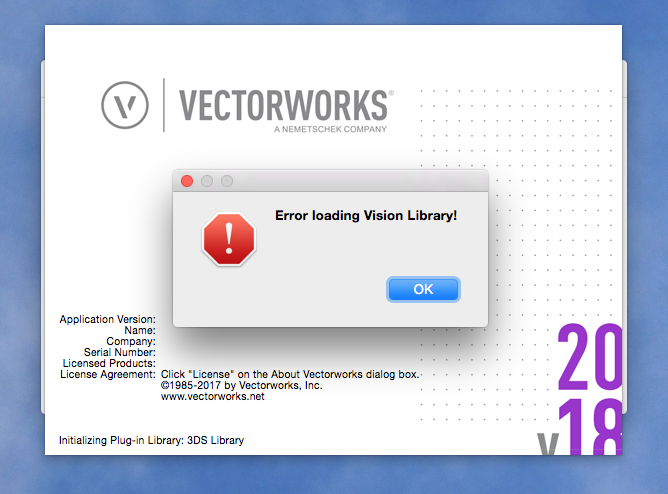 Every time I double click an instrument to edit, I get "There was an error loading the Vectorworks Vision Plugin." I'm losing my mind. I'm going to order a field template and Arch E paper so I can keep working in case I throw my computer off the balcony. I was having problems with the pallette positions not saving in SP-3. So I used Jim's instructions to reset my preferences. Now I get an error message stating That there is an error loading vision library. Any ideas as to how to fix? Full uninstall / reinstall solved it for me. Unfortunately that's what Tech Support offered as a solution. I had been trying to avoid it and hoping for a "scalpel" solution instead of a "sledgehammer" solution (using @JimW's analogy). Doing so will mean I've reinstalled VW2018 twice and reset the preferences multiple times. Last year I had to reinstall VW2017 once. Prior to that I don't remember ever reinstalling VW, at least since the yearly releases started with VW2008. 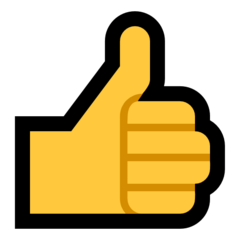 Its time for better beta testing and cloud based user preferences that can be healed by Tech Support.... all these preference resets and reinstalls represent a fair amount of troubleshooting time. We want to grab the problem installer logs before you do a re-install. We know a re-install usually fixes the problem but we want to see if we can find out why the first install is failing so we can fix the problem. An installer log form a problem install should give us a lot of information on where the problem is or more importantly where the problem is not.